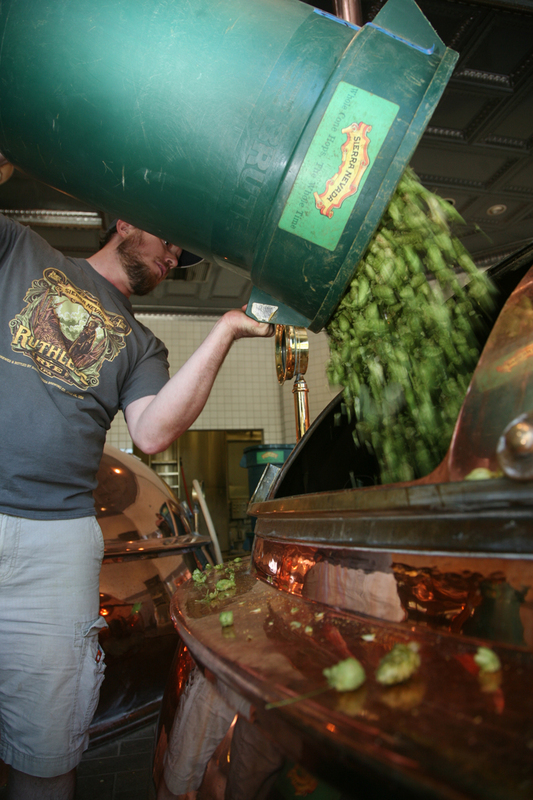 A hop addition at Sierra Nevada Brewing Co.
Celebration Ale, which has been in production since 1981 and in its current form since 1983, is an enigma of a beer. It’s a holiday beer, so consumers might expect it to have the standard spices—nutmeg, cinnamon—but instead will find hop aromas and bitterness akin to an IPA. Since 2010, Sierra Nevada Brewing Co. has labeled it as a fresh hop ale, garnering confusion with wet hop ales, which are also often referred to as fresh hop ales. “Here in Chico and I think a lot of Sierra Nevada fans hold Celebration Ale up as their favorite beer on the planet. It’s one of the first three or four IPAs ever made, although it has never really been marketed as one,” says Tom Nielsen of Sierra Nevada. There are no holiday spices and the hops are dried, not wet, but they are selected from the freshest hops possible from the current year’s harvest. It was an incredibly revolutionary idea, says Sierra Nevada Brewmaster Steve Dresler. While there isn’t a risk of dried hops rotting and spoiling, the logistics of sourcing them are similar to wet hop beers. The first week of September, one of Nielsen’s goals is to identify the best fields of Cascade and Centennial, the finishing hops used in Celebration. He then makes sure they’re handled optimally in the kiln, dried at low temperatures, baled and put right into refrigerated trucks. “The reason that beer stands out year after year is we really put a lot of effort into the process of finding the best fields possible to make that beer,” says Nielsen. Typically, says Eric Desmarais from CLS Farms in Moxee, WA, who has worked with Sierra Nevada for Celebration Ale, after whole-leaf hops are dried and baled, they’re moved into cold storage, where they can reside for six to 24 months before a brewer would use them in a beer. For Celebration Ale, there is no waiting period. In dried bales of whole leaf hops, and even in pellets, there is slight breakdown over time: They oxidize and lose some of the potency. The aroma might flatten out a bit and lose that punch, says Desmarais. The dried hops in Celebration Ale retain that freshness. “When you get them completely fresh like this, there is absolutely no breakdown at all in them. It’s akin to an apple tree in your backyard. If you went out and picked that apple at perfect time and ate it, that’s a different kind of eating experience then getting an apple at the supermarket,” says Desmarais. Read a feature story on wet hop beer. When did “IPA” first appear on the Celebration Ale label. Striking contrast with the Anchor Steam seasonal which is over the spice limit for me.